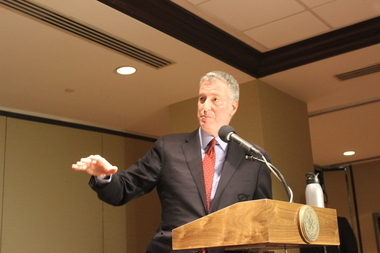 As the federal investigation into his political fundraising activities continues, Mayor Bill de Blasio questioned the political motivations behind the leak of a letter from the State Board of Elections questioning the legality of his effort to raise money to help Democrats take control of the state Senate in 2014. MIDTOWN — As the federal investigation into his political fundraising activities continues, Mayor Bill de Blasio questioned the political motivations behind the leak of a letter from the State Board of Elections questioning the legality of his effort to raise money to help Democrats take control of the state Senate in 2014. "In this instance, there is an obvious question mark around that memo that was leaked to the press and real questions about motivation and obviously huge questions about accuracy in terms of the law," the mayor said during an unrelated press conference in Brooklyn. The January 2016 letter from Risa Sugarman, the state Board of Elections' chief enforcement counsel, accuses de Blasio and his team, including top aide Emma Wolfe, of purposely violating election law by routing donations to three upstate senate candidates by using county committees to avoid donation limits. Sugarman said the violations were "willful and flagrant" and warranted "criminal prosecution," according to a memo first obtained by the Daily News. Over the weekend, de Blasio campaign lawyer Laurence Laufer, sent a seven-page letter to Sugarman and Manhattan District Attorney Cyrus Vance Jr., who is investigating the issues raised in the letter, calling the leak of the memo a "highly prejudicial and perhaps politically-motivated act," according to a copy of the letter obtained by DNAinfo. Laufer also accused Sugarman of having a "profound misunderstanding of election law" for "treating a coordinated political party effort to elect a majority to the State Senate as some kind of criminal conspiracy." Asked who or what he thought was responsible for leaking the memo, de Blasio did not name anyone. "I'm quite certain that you will be able to uncover whatever motivations may have existed," de Blasio told members of the media gathered at the press conference. "But we can say this: A government officer is supposed to honor their responsibilities. First of all, that should never have been put into the public domain. And second of all, when you look at how inconsistent it is with state law it begs the question what was the underlying motivation," the mayor added. De Blasio has had a long-running feud with Gov. Andrew Cuomo. The mayor is also facing federal investigations around two businessmen, Jeremy Reichberg and Jona Rechnitz, who provided cash and trips to high-ranking NYPD officers, and donations the men made to the mayor's campaign and to a non-profit, the Campaign for One New York, that de Blasio used to push his political agenda. Authorities are examining whether groups that made donations to the nonprofit received anything in return. De Blasio said that he could "unequivocally" say that he violated no laws. "I think it's important that the facts be found in this case. A lot of very good people are having their names dragged through the mud over these last few weeks," the mayor added. "That's not right, that's not fair."